This year marks the 50th Anniversary of the Wilderness Act. When the act was signed into law by President Lyndon B. Johnson on September 3, 1964, it set aside 9.1 million acres of land in 54 areas that became designated wilderness. The act also created a way for additional federal land to be set aside as wilderness and permanently protected from development. Today there are over 750 designated wilderness areas within the United States, representing about 5% of the total land area of the United States. In the southern Los Padres National Forest, there are eight designated wilderness areas spread out over San Luis Obispo, Santa Barbara and Ventura Counties. 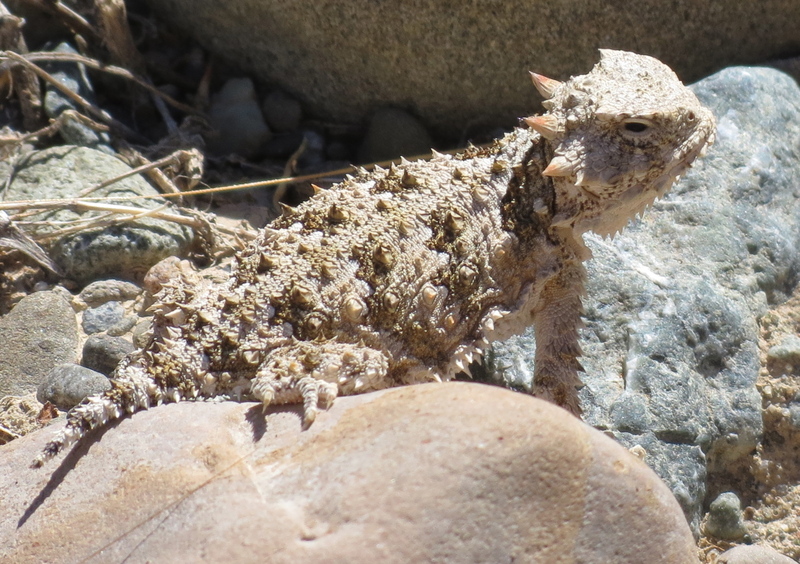 Of these, the first to be protected was San Rafael Wilderness in Santa Barbara County. San Rafael Wilderness encompasses close to 200,000 acres, including much of the San Rafael Mountains, Manzana Creek, Hurricane Deck, and the upper Sisquoc River. One of the easier places to visit San Rafael Wilderness is from the trailheads near Nira Campground, along Manzana Creek. The creek originates along the backside of San Rafael Mountain and travels roughly 20 miles downstream to the confluence with Sisquoc River. Near Nira, one can find trailheads that lead both upstream and downstream along the creek. The hike downstream includes four trail camps that one can visit. 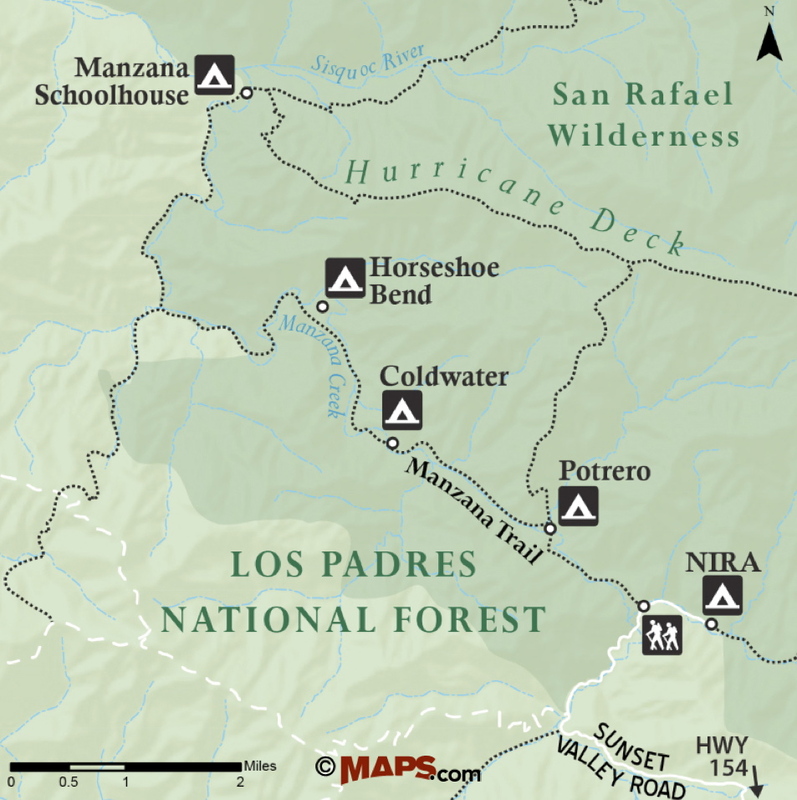 To get to the trailhead from Santa Barbara, take State Route 154 over San Marcos Pass, and continue past Lake Cachuma to Armour Ranch Road, on your right. From Armour Ranch Road, turn right onto Happy Canyon Road. Happy Canyon Road leads through ranch land before climbing out of the valley and arriving at Cachuma Saddle. At Cachuma Saddle, Happy Canyon Road meets Figueroa Mountain Road, becoming Sunset Valley Road, and continues down the backside of the San Rafael Mountains. Sunset Valley Road passes Davy Brown Campground and, about a mile later, arrives at Manzana Creek and the trailhead for the section of Manzana Trail that leads downstream towards Manzana Schoolhouse. About a half mile past the trailhead, Sunset Valley Road ends at Nira Campground. Camping can be found at Davy Brown, which has 13 campsites, and at Nira, which has 11 campsites. Both campgrounds are on a first come, first serve basis and require an adventure pass to camp there. Parking for the hike downstream can be found at the trailhead; the parking area is large enough for horse trailers. The trail is in generally good shape and suitable for horseback riding. 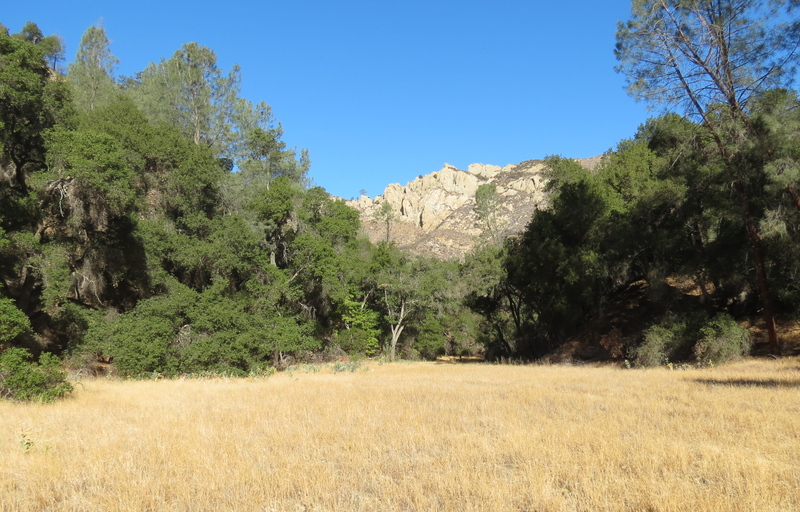 From the parking area, the trail crosses Davy Brown Creek and enters San Rafael Wilderness. Manzana Trail then rides above Manzana Creek for the first 1.25 miles before dropping back down to the creek, and arriving at Potrero Camp. The camp has two sites both along the creek. The camp takes its name from the nearby Potrero Trail, which leads up to Hurricane Deck. Past Potrero Camp, Manzana Trail follows the creek the rest of the way down to Manzana Schoolhouse, crossing the creek more than 30 times and providing ample opportunity to get to know the different plants that thrive along this riparian corridor. At about the 2.75-mile mark, the trail arrives at Coldwater Camp. The camp has two sites and takes its name from the pools just upstream from the camp that typically have water in them, even in the fall and during drier years such as this one. In contrast with the hike upstream from Nira, the hike downstream includes more open, grassy areas as the canyon widens on its way down towards Sisquoc River. At about the 4.5-mile mark, the trail arrives at Horseshoe Bend. Here, one can find three campsites in the long meadow to the right off of the main trail. The camp takes its name from the horseshoe-shaped meadow that may have been formed by the creek before it worked its way through the nearby sandstone formation, where the creek passes today. About a half-mile below Horseshoe Bend the trail arrives at an unpaved ranch road that traces the boundary between San Rafael Wilderness and a private inholding within the National Forest. Please respect private property at all times. The inholding is part of what was once the Davis Homestead and is a remnant from the late 1800s, when there were roughly 200 settlers living along the upper Sisquoc River and its tributaries. These settlers were drawn to the area with the promise of land under the Homestead Act. That act, which passed in 1862, provides an interesting perspective on how our perceptions of the land have changed over time. Within the Homestead Act was the stipulation that in order to acquire land under the act, one needed to “prove up” their claim by building a home, making improvements to the land, and farming it for a minimum of five years. In many ways the act was a reflection of a cultural value articulated in the late 17th century by English philosopher John Locke, who felt that nature on its own provided little value to society, and that it’s the labor we expend in the creation of goods that gives those goods their value. And by extension the labor expended on the land is not only what gives it value, but is the basis of ownership, because that labor belongs to us. In other words, for the land to have value it must be developed. By the mid-18th century and new perspective began to emerge through the writings of Henry David Thoreau and later John Muir, who held that the land had an intrinsic value beyond the development of its resources. Through his writings and activism, Muir gave a voice to the perspective that what was needed was less development, and that the intangible benefits of nature need to be valued and preserved. 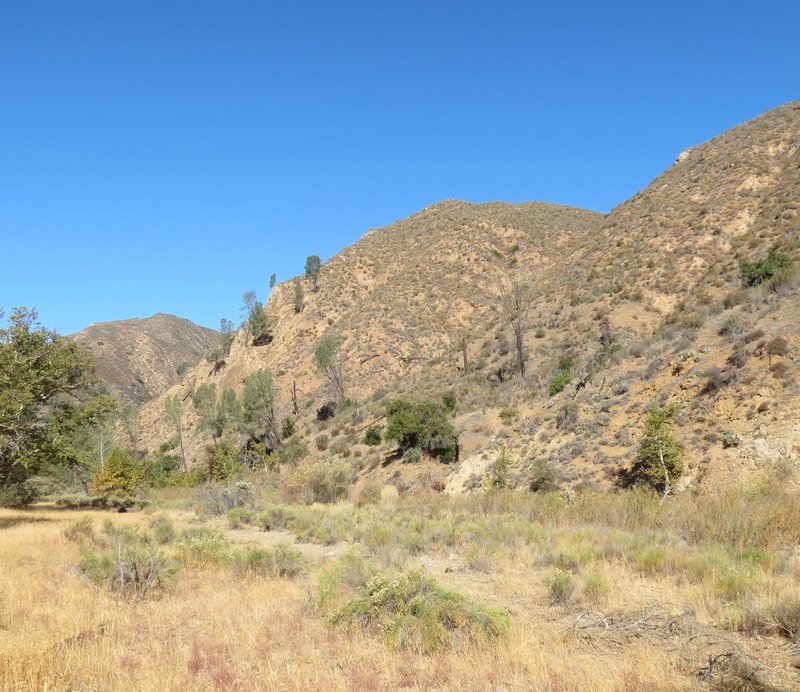 In this regard, San Rafael Wilderness, with its homesteads sites, Chumash cultural sites and undeveloped wilderness, offers a unique opportunity to reflect on the various approaches to land use and the different relationships we can have with the land. Continuing downstream along Manzana Creek, at about the 6.25-mile mark, Manzana Trail arrives at the junction with Sulphur Spring Trail, which leads to the top of the San Rafael Mountains. 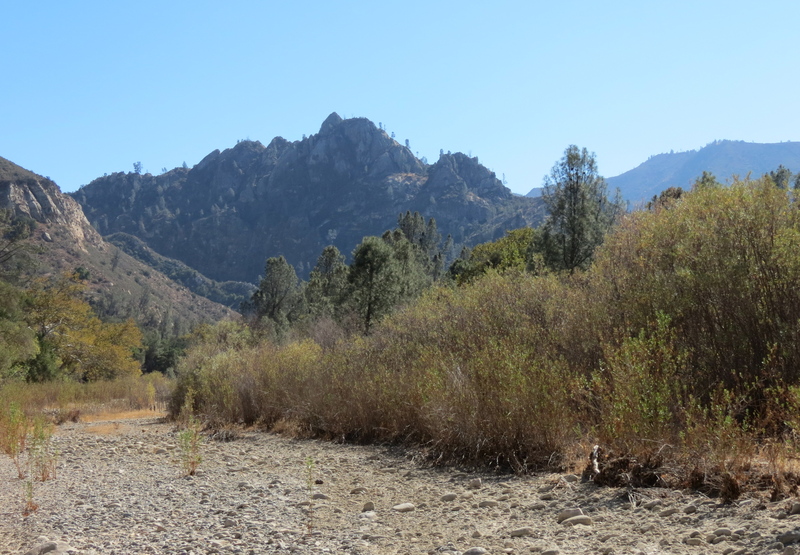 A half mile further downstream, Manzana Trail arrives at the site of Dabney Cabin. The cabin was constructed from nearby alder trees and creek rock, and served as a fishing retreat for the Dabney Family. Currently, there is flowing water at the site, and it is one of the few places along Manzana Creek where one can find water during the drier times of the year. At about the 8.5-mile mark, the trail arrives at Manzana Schoolhouse Camp. The camp has six sites under the oaks, next to the creek. 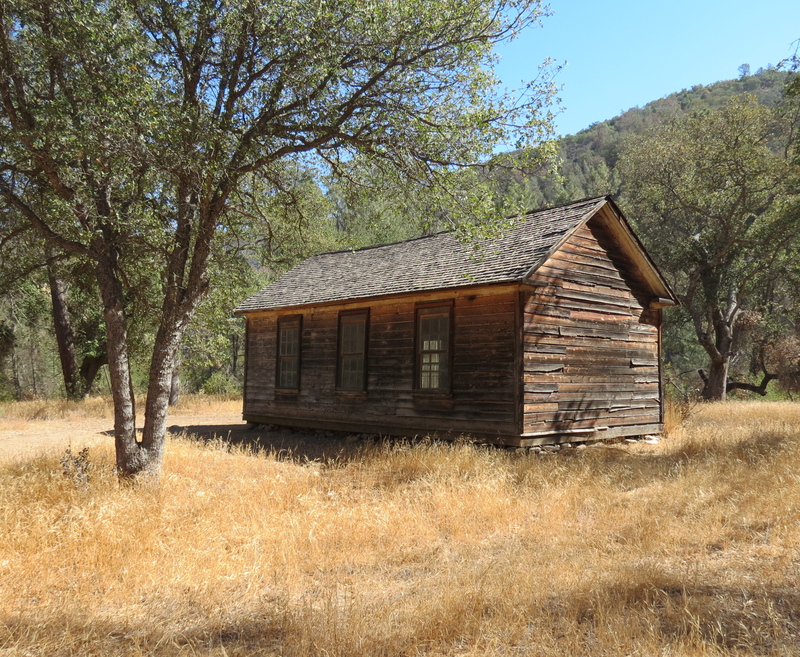 On the mesa, above the confluence of Manzana Creek and Sisquoc River, is the one room schoolhouse that served the early settlers of the area from 1895-1902. Each of the campsites along Manzana Creek has a picnic table and either a metal fire ring or grated stove. In the springtime, when the creek is fully flowing, water can be found at all of the camps. From Manzana Schoolhouse one can journey still further into the San Rafael Wilderness along Sisquoc River Trial. Regardless of how far you go you’ll get to see some of what makes San Rafael Wilderness a unique area within our local backcountry. This article originally appeared in section A of the October 27th, 2014 edition of Santa Barbara News-Press. Water Report: currently, the are a series of standing pools just upstream from Coldwater. Water is flowing at the Dabney Cabin site, i.e. water is flowing in the creek two crossing above and two crossing below the cabin.